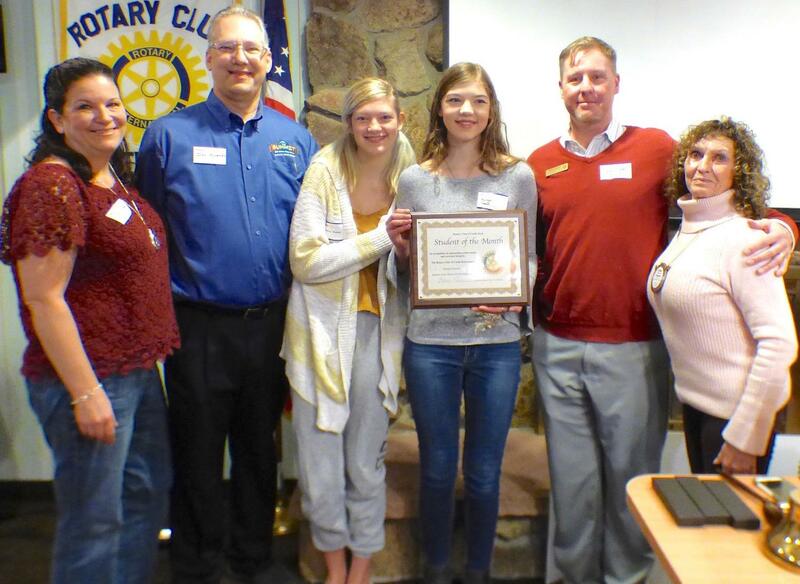 Castle View High School senior Morgan Knuesel has been named Rotary Club of Castle Rock's Student of the Month for November. Knuesel was at the club this week to accept the honors. With her were her mother Jennifer, father Donald and sister Katherine. Also at the presentation were CVHS Assistant Principal Derek Cordes and club president Elaine Love. Morgan Knuesel has been named Rotary Student of the Month by the Rotary Club of Castle Rock. Knuesel, a senior at Castle View Middle School was introduced to the club at a recent meeting. Knuesel carries a 4.1 grade point average and ranks eighth in a class of 554. She has been on the Principal’s Honor Roll all three years of high school, has received an Advanced Placement Scholar Award and has received an Academic Letter for three years. Knuesel is very active in figure skating. She has been in competitive figure skating since 2015 and has competed in Showtime on Ice and Ice Theater of the Rockies. She took first place in a Colorado competition and competed at the Theater on Ice Nationals in Illinois in 2018.